For years robots have been able to play musical instruments, but now thanks to artificial intelligence and deep learning technology, developers at Georgie Tech have taught a robot to compose. A four-armed marimbist robot named Shimon, capable of wielding eight mallets at a time, has been gigging alongside human players for years – and was even featured on The Colbert Report – but now the virtuoso performer is in the running to become the next Bothoven. 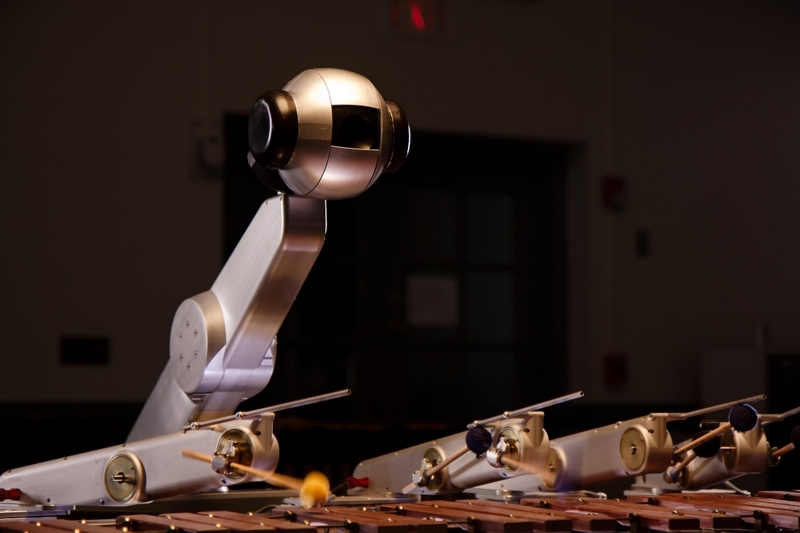 Researchers at Georgia Tech have taken the robot’s musical skills to new heights, Georgia Tech News reports, feeding the robot datasets including nearly 5000 complete pieces of music and over two million shorter fragments and motifs – from artists as diverse as Beethoven, Miles Davis and Lady Gaga. The composer robot has already debuted two new works online and will premiere its first works live at the Aspen Ideas Festival in Colorado in June. While Bretan has worked with Shimon for seven years, during which time the robot has learned to “listen” to human players and improvise over chord progressions, it is only more recently that the robot has become a composer in its own right, generating both melody and harmony unaided – an initial “seed” of four bars is used as a starting point, but from then on no humans are involved in the compositions Shimon performs. The robot is also now capable of playing harmonies and chords – a dramatic improvement from the robot’s days improvising single melody lines. “Shimon is now coming up with higher-level musical semantics. Rather than thinking note by note, it has a larger idea of what it wants to play as a whole,” Bretan said. Emerging and established artists across a range of disciplines have been given the resources to pursue and develop their careers.